Mangaluru, Oct 8, 2017: The video of a young lady from France, clad in a traditional silk saree and dancing to the rhythmic beatings of the drums along with Huli Veshadharis during the recent Navaratri festivities in Mangaluru, had gone viral on social sites. Many had wondered who was this lady who danced so exuberantly. She is Noémie. A French national, Noémie who is studying Creative Dance Therapy in Bengaluru loves globetrotting and learning about culture and traditions of different nations and regions. She was in Mangaluru to participate in the Dasara festivities and happens to be a friend of Mangalurean Sachita Nandagopal. 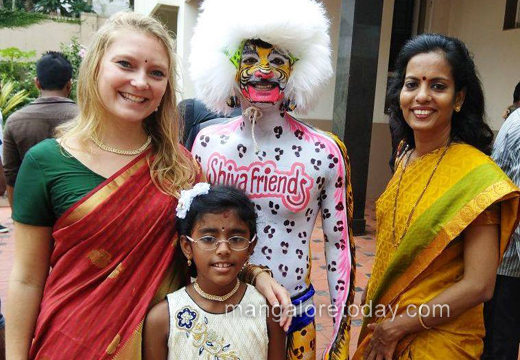 When Sachitha informed her about the Dasara splendour of Mangaluru, a curious Noyami had decided to visit Mangaluru during the semester holidays and there she was dancing with the Tigers of Mangaluru. She had visited Kudroli Shree Gokarnantheshwara Temple, Sharavu Temple as well as various other temples. 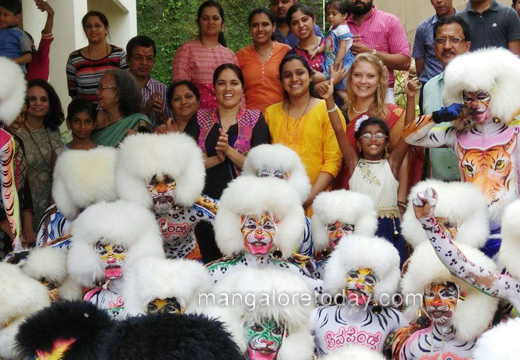 When she happened to visit the Mr Santhosh Gadiyar house at Kapikad she came across a tiger dance team and was so wonderstruck with the performance that she too danced with them merrily much to the applause of those gathered as well as the tiger dancers. "Was immensely happy to be a part of Mangaluru Dasara, loved the warmth and hospitality of Mangalureans. I enjoyed the Neeru Dose, Pundi and Thimare chutney. Was tremendously excited to dance with the Huli Vesha teams," says Noémie who has celebrated Onam in Kerala and plans to go to Coimbatore for Deepavali.